Rafflesia - the flower that conquered the world, a flies delight, lauded and maligned, the paradoxical and amazing flower which can be seen in the Kalanganan sub-village in Barangay San Vicente, Baungon, Bukidnon. The Higaonon tribe living near the rainforests at the foot of Mt. Kitanglad were among first to see the unimposing plant which the natives call Kolon Busaw. Governor P. Alex Calingasan said the plant should be nurtured and protected to help it grow and flourish. We are lucky that this rare plant sprouted in our woodland because as environmentalists say, it serves as an indicator of an extreme healthy and balanced nature, Calingasan said. The Provincial Tourism Office, Department of Environment and Natural Resources and Department of Tourism in Region 10 have coordinated with the local government of Baungon on safeguarding Rafflesia. Pursuant to Republic Act 9147 or the Wildlife Resources and Protection Act, the local government of Baungon has ratified an ordinance prohibiting ripping up, uprooting and relocating the flower. The ordinance also prohibits pulling woody vines. Those found guilty of violating the law will be imprisoned from six to 12 years and will pay P100,000 to P1 million as penalty. Rafflesia is recognized as the largest flower in the world. It lives on the stems and roots of woody vines. Its large, pink, five-lobed flowers are pollinated by carrion flies (meat flies). It grows up to 91 cm (36 in) in width, with petals of 3 cm (1 inch) thick and 46 cm (18 in) long. It weighs as much as 7 to 11 kg (15-24 lbs). Rafflesia, dubbed the corpse flower because of its putrid, carrion odor, is a genus of various parasitic, rootless, stem less, and leafless plants. 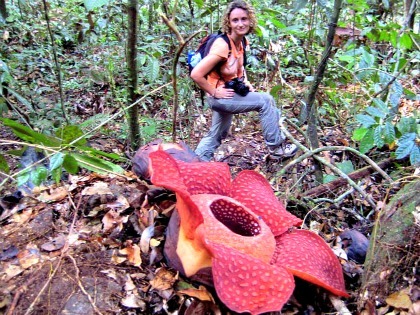 When this huge flower blooms, it emits the smell of rotting meat to attract insects - the Rafflesia's only hope for reproduction.